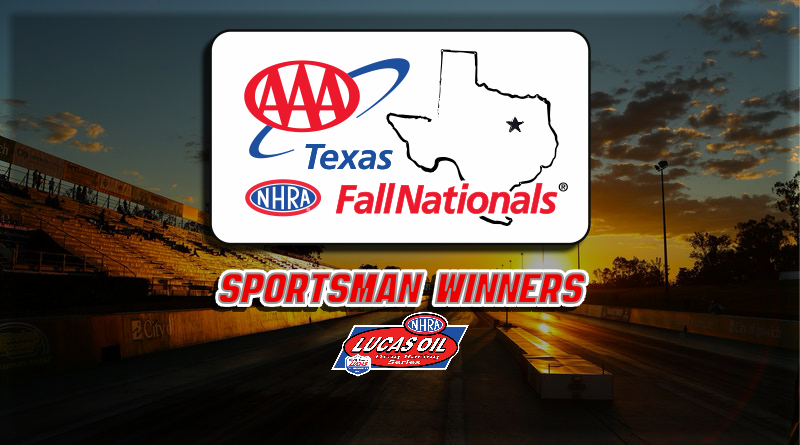 ENNIS, Texas, – In the final results from the AAA Texas NHRA Fall Nationals and the NHRA Lucas Oil Drag Racing Series at Texas Motorplex, Leah Pritchett, Redlands, Calif., and Kevin Skinner, Grove City, Ohio, both worked their way through the field to meet up in the final round and a winner take all for the SAM Factory Stock Showdown World Championship. Pritchett and Skinner had a close start of the line with Skinner in the lead at the 300-foot mark until his car made a quick move allowing Pritchett to go around and pull away for the win and the championship. Pritchett had a late charge in the season making this her 3rd consecutive win in the SAM Factory Stock Showdown. Joey Severance, Woodburn, Ore., and Sean Bellemeur, Placentia, Calif., took home the wins in Top Alcohol Dragster and Top Alcohol Funny Car respectively. DragChamp is drag race central for all the latest NHRA sportsman racing results. Visit DragChamp daily for complete NHRA Lucas Oil Drag Racing Series sportsman race results.